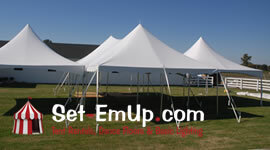 Set-EmUp Tent Rentals in Nashville, TN is located in Greenbrier, TN. We service Nashville, Middle Tennessee, and Southern Kentucky. We are a tent rental service company that can facilitate your next event. Set-EmUp offers tents in a variety of sizes and configurations at reasonable prices. We also setup dance flooring, and lighting to transform your tent into something truly unique.